Chances are, you brush your teeth every day in an effort to keep cavities and other dental problems at bay. But many pet owners neglect to put the same amount of care into maintaining the health of their pet’s pearly whites. Like humans, pets are susceptible to cavities. If left untreated, poor dental hygiene can lead to kidney, liver, and heart complications, or even diabetes. Unfortunately, dental health conditions like these are far too common among pets. Most dogs and cats develop periodontal disease by age three, according to the experts at pet insurance company Trupanion. Some of the symptoms of this chronic, irreversible condition include swollen gums, increased drooling, whining while eating, loss of appetite, weight loss, bleeding, and loose or discolored teeth. But regular teeth-brushing can help to prevent the onset of such problems. To prevent the buildup of plaque and tartar, veterinarians recommend brushing your pet's teeth several times a week. Not sure how to go about cleaning your pup's teeth? Dr. Katy Burr, on-staff veterinarian at Trupanion, has a few tips. Buy pet-specific toothpaste. Since human toothpaste can upset pets’ stomachs, look for toothpaste specially formulated to be safe for pets. Use a toothbrush or gauze. To brush your pet’s teeth, brush in a circular motion using a toothbrush or gauze wrapped around your finger. To keep the toothpaste from falling off when you start brushing, try smearing a small amount on your pet’s teeth and then brushing. Make it a daily routine. Burr recommends brushing your pet’s teeth at least twice a week, ideally at the same time each day. Having a daily routine will make training easier. Use chew toys. The gum massage that occurs when your pet gnaws on a nylon or rubber chew toy can help to remove tartar. Burr also recommends that pet owners perform a monthly examination of their pet’s mouth. Things to look for include bad breath, cysts or tumors, missing or loose teeth, redness, inflammation, and too much moisture or drool. Additionally, pet parents should make sure to get their pet’s mouth checked out by their veterinarian at each visit. 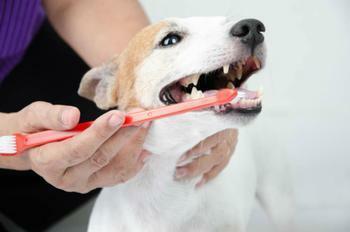 Some vet offices even offer tooth and gum cleanings and mouth care services.